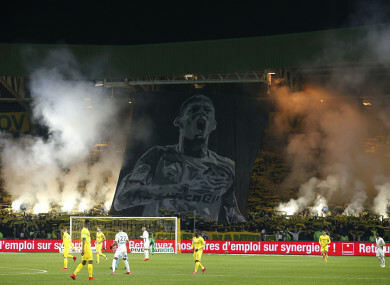 File photo: Fans in Nantes play tribute after Sala's plane disappeared last month. FRENCH FOOTBALL CLUB Nantes have asked two lawyers to explore legal options to ensure Cardiff City pay the transfer fee for Emiliano Sala, a source close to the French club revealed today. According to the source, the first installment of the €17 million deal for the Argentine striker has yet to be paid, despite the transfer being finalised. Nantes would also consider taking the case to Fifa, the source added. According to BBC Wales, Nantes have given Cardiff a 10-day ultimatum over the first payment of €5 million. A source at Cardiff told British media that the Welsh club will honour the contract but only once they have clarified “all the facts”. A body was spotted in underwater images of the wreckage and Britain’s Air Accidents Investigation Branch (AAIB) has launched an operation to try and recover it. Sala, who signed a three-and-a-half year deal with Cardiff, was the club’s record signing. The two clubs had agreed on a payout in three installments, which is relatively common in big transfers. Sala’s former club Bordeaux, who sold the Argentine to Nantes in 2015, are entitled to receive half of the total fee. Email “Nantes considering legal action over €17 million Sala payment”. Feedback on “Nantes considering legal action over €17 million Sala payment”.